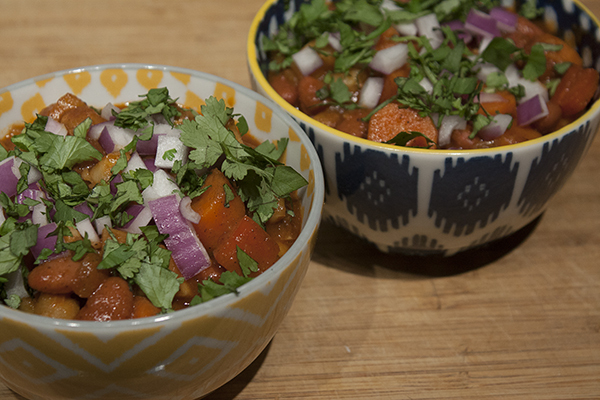 On Friday night, we made one of our vegetarian faves: Winter Vegetable Chili from “Food + Wine”. We already had some carrots in the fridge, so it was a simple thing to buy some parsnips and red bell pepper to complete the vegetables. Tony describes how this dinner came together. When we’ve made this before, it’s been on the weekend, as it takes a little time to make, but we figured a Friday would work just as well. Plus, with us going mostly meatless for Lent, we knew it wouldn’t be long before we made this chili. With the sauce in the pot with the veggies and the beans and hominy added too, there was nothing left to do but set the chili to simmer, pop open a cold beer, and wait. After about 20 minutes, dinner was ready to be served. We garnished the chili with diced red onion and chopped cilantro, which were great, but really wished we had some sour cream in the fridge. In addition to giving up red meat and poultry for Lent, we also gave up snacks, which we broadly defined to include tortilla chips, so we weren’t able to have those with the chili. Instead, we sliced up some crusty French bread, which, while not as good as chips, was still pretty good. The chili came out perfectly, once again. It was spicy without setting our mouths on fire. It was also a nice balance of savory, from the beans, tomatoes, and hominy, and sweet from the parsnips and carrots. Paired up with the aforementioned cold beer (Lagunitas IPA, to be exact), it made for a great vegetarian dinner – with a little left over for some vegetarian lunches!